Tempe, AZ, which was once known many years ago as Hayden’s Ferry, has grown into a city of almost one hundred seventy five thousand residents and also home to one of the most prestigious universities in the country, Arizona State University. Tempe, AZ is also home to such unique communities and neighborhood developments as Pecan Grove Village, Parke Tempe, Tempe Royal Palms, Sandahl, or one of the many beautiful community developments that call Tempe, AZ home. As any of the residents will tell you, each community development and/or neighborhood has its own unique feel or style, but they all share one belief in common: they insist on doing whatever it takes to keep their homes in the best shape possible because, in most instances, their home represents a major portion of their assets. Are you considering a remodeling project for your Tempe, AZ home? Regardless of whether you choose a minor or major project to remodel such as a kitchen remodel, a complete house remodel, a garage remodel, a bathroom remodel, an Arizona patio remodel, or a home office remodel, to ensure your project will proceed smoothly, it’s vital that you choose the proper General Contractor for your remodeling project. The Tempe AZ General Contractor you hire should have extensive expertise and experience, will only use top-notch sub-contractors who are fully insured, experienced, and licensed, using only materials and appliances of superior quality, and also has that ability to comprehend what the client’s plans and wishes are concerning their remodeling project and will do whatever it takes to make sure the final project results are what the client had in mind for their project in the first place. 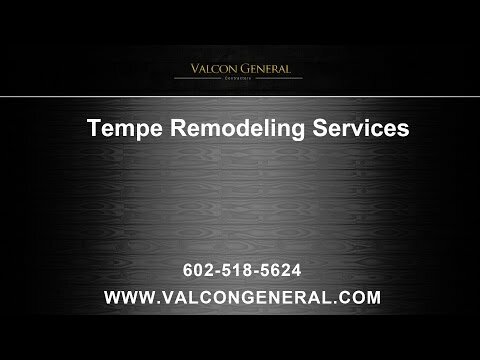 It is for these very reasons, that quite a few homeowners in the Tempe, AZ area have decided the best remodeling General Contractor for their remodeling project is Valcon General. Whether your project is for a sub-division home, custom built home, or condo or townhome, having Valcon General as your General Contractor is one of the best decisions you will make to ensure the project runs smoothly. The first item on the to-do list, when talking with our clients about their kitchen remodel, is to assist them in choosing their cabinets. With our years of experience, we strongly recommend our clients install custom-made cabinets in their new kitchen. There are two very good reasons for this recommendation: first, with custom drawers and cabinets, we can design them with your family needs in mind, and because they are custom made, we can custom fit them to the space available, giving you much more storage space; and, secondly, because they are custom made, they will add to the overall value of your home and will outlast store-bought cabinets. Once your choices have been made concerning the custom cabinets, you will have decisions to make concerning your choices about paint colors, kitchen fixtures, counter-top choices, faucet and sink styles, appliance choices, flooring options, backsplash choices, and lighting fixture options, all the while keeping in mind how these choices will match up and still stay within your budget. Valcon General will assist you during this entire process, helping you with your choices, thus easing the tension a client may have if they had to do it by themselves. Is a guest bathroom remodeling or master bathroom remodeling project at the top of your wishlist? After ten plus years and well over a hundred bathroom remodels to their credit, Valcon General should be your one and only choice to manage your remodeling project. As with any remodeling project, you will again be making choices about the shower or bathtub setting you would like to have installed, faucets, showerheads, finishes, paint colors, and tile choices. Again, with Valcon General’s experience and guidance, they can guide you through this process, which, in turn, will make the process much easier. Again, we urge our clients to only use custom-made cabinets and will also assist our clients with the choices of flooring available so everything will complement the total look. If you are considering additional remodeling projects such as a complete home remodel, patio remodel, home office remodel, or a garage remodel, one sure way to ensure that your project runs on time and budget is by having Valcon General as your General Contractor. At Valcon General, we believe it’s very important to spend whatever time is necessary reviewing all the details regarding the remodeling project with our client, making sure that all of their concerns and questions are answered, thus ensuring the project will run much smoother. For over ten years and counting, Valcon General has vigorously worked to maintain their superior reputation for workmanship and professionalism, keeping in mind their promise to all their clients that no job is complete until the client is satisfied. If you are considering a remodeling project for your Tempe, AZ home, townhouse, or condo, we would be honored to work with you on your next project.